Tonight I get to watch La Course by Le Tour on television in my living room in Australia which I’m going to enjoy but it’s a race not without its controversy. I’ve been reading a bit of media commentary over the past few days about the really lame effort the Tour de France organisers ASO have made with this event. Even the website is lame. It’s out of date (doesn’t even list the 2017 winner) and it has very little information. I really enjoy former pro rider Kathryn Bertine’s spirited commentary on the subject and I’ll let you enjoy that coverage for yourself. Instead of getting embroiled in that debate I want to highlight a group of extraordinary women, not professional cyclists who are riding the Tour de France themselves. They are a group of French cyclists who call themselves Donnons des elle au velo (Give them the bike) and they are riding every stage of the Tour de France one day ahead of the professional race. 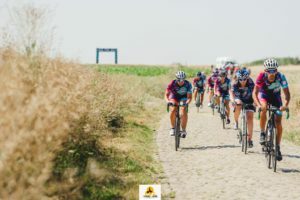 I’ve actually heard of other groups doing something similar but what sets them apart is that they are all women, and they are doing it to raise the profile of women’s cycling. In fact this is the fourth time they’ve done the same ride. They say their aim is to promote women’s cycling and unite cyclists of different styles and levels, from beginners to professionals. They want to incite the race organisers and authorities to launch a big women’s stage race on the French territory. In turn they plan to increase the media coverage of women cycling to change the image, break the stereotypes and present the heterogeneity in sport. The group has a great Facebook page where you can track their progress. Unfortunately for those of us who don’t read French, it’s a little hard to read. I’ve been utilising Google Translate to understand the posts, but even if you don’t understand the words there’s lot of images and videos. Here’s a snippet from the Annecy to Le Grand Bornand stage that they rode yesterday, a similar course that the La Course riders will follow today. So are you watching La Course by Le Tour from wherever you are in the world? Share your thoughts on the subject via comments or the Women Who Cycle Facebook page. I’m watching! Wish we’d been able to watch the 10 stages of Giro Rosa too. Great work on this site. It’s among only a handful that focuses solely on women cycling today. Btw, if you happen to be down in Melbourne, give me a shout and perhaps we can go for a ride + coffee one day.